Beautiful hotel & property! Lots of on site restaurants to choose from, hotel staff friendly & helpful. We will be back! Our experience was great! Maybe there should be another bank of elevators,but that is all. Everything was great except the crickets in the bathroom. Very nice hotel. Staff was very courteous and helpful. The rooms were super nice as well. Has everything you need! Breakfast was wonderful, and has a large selection. Right next to the shops and La Cantera. Would stay again! I was amazed how luxury, clean and nice the staff are at Eilan. I love it! Food, room, pool, gym and lobby was all extravaganza! 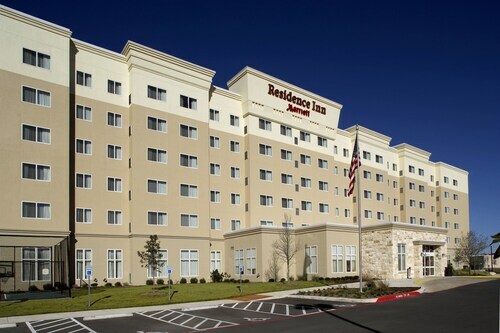 Situated in San Antonio, this hotel is within 3 mi (5 km) of The Rim Shopping Center, Six Flags Fiesta Texas, and The Shops of La Cantera. University of Texas-San Antonio and Palmer Course at La Cantera are also within 6 mi (10 km). Nice hotel close to seeing Fiesta Texas and Topgolf. The bathroom is tremendous and the sheets and pillows are clouds. Situated in San Antonio, this hotel is within 2 mi (3 km) of Six Flags Fiesta Texas, The Shops of La Cantera, and The Rim Shopping Center. University of Texas-San Antonio is 2.3 mi (3.8 km) away. Situated in San Antonio, this property is within 2 mi (3 km) of Six Flags Fiesta Texas, The Shops of La Cantera, and The Rim Shopping Center. University of Texas-San Antonio is 2.6 mi (4.1 km) away. Situated in San Antonio, this vacation home is within 2 mi (3 km) of Six Flags Fiesta Texas, The Shops of La Cantera, and The Rim Shopping Center. University of Texas-San Antonio is 2.6 mi (4.2 km) away. Six Flags Fiesta Texas is an excellent place to go to with the entire family. It's a good idea to bring your camera along too! It's one of the many attractions that makes Austin, the state capital, such a popular destination for travelers. 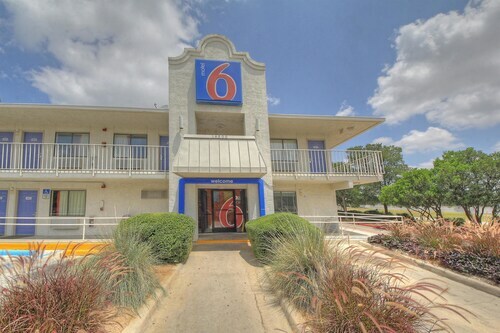 With just about 13 accommodation possibilities only 2 miles (3 kilometers) from Six Flags Fiesta Texas, you shouldn't have any issues finding something to suit your needs. 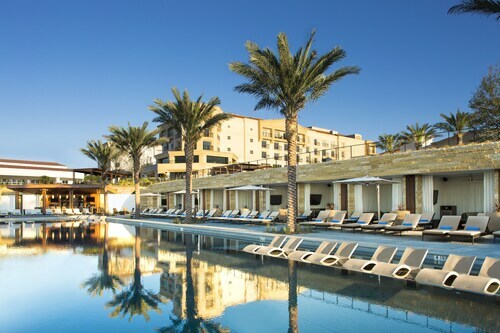 The La Cantera Resort & Spa and the Eilan Hotel & Spa, Autograph Collection are excellent choices here, found 0.7 miles (1.1 kilometer) and 0.5 miles (0.8 kilometers) away, respectively. The less you spend, the longer your vacation can last! You can get hot deals on hotels nearby. 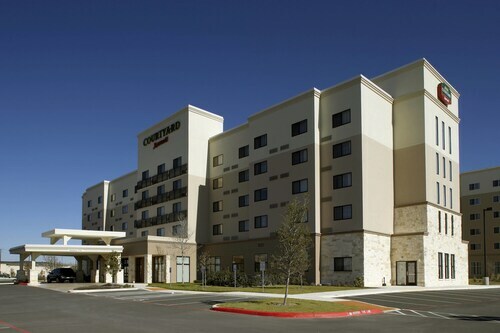 Some examples are the Quality Inn San Antonio Fiesta at Six Flags and the SpringHill Suites by Marriott San Antonio NW at The Rim, which are 1 mile (2 kilometers) and 1 mile (2 kilometers) away, respectively. 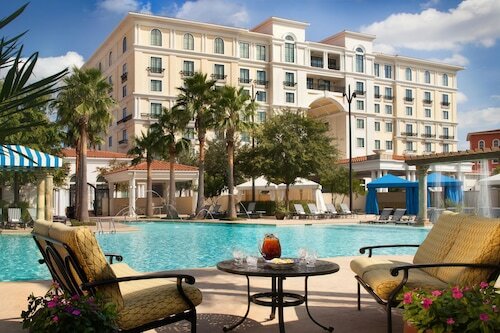 There is no reason to feel shy about indulging yourself at the Omni San Antonio Hotel at the Colonnade, an extravagant establishment just 5 miles (8 kilometers) away. If you need a bit of a timeout, settle down with a newspaper and a steamy beverage in a cozy corner of Mimi's Cafe (17315 Frontage Road, San Antonio.) A nice local restaurant, 54th Street Restaurant & Drafthouse (17122 West Interstate 10, San Antonio) provides some heartier fare that's guaranteed to please even the most famished traveler. Find some lovely gifts at The Rim Shopping Center. If you're a golfer and would love to play, check out La Cantera Golf Club. Embark on a shopping frenzy at Shops of La Cantera, a favorite shopping destination for locals and visitors alike. Whether you're a golf lover or simply starting out, don't miss the chance to play a round at Palmer Course at La Cantera. University of Texas-San Antonio is not only an institution for academia, but it is also known as a motivational place for the area's community members. When it's time to go home, get on the metro at Spassburg Station, 0.5 miles (0.8 kilometers) from Six Flags Fiesta Texas. How Much is a Hotel Room in Six Flags Fiesta Texas? Hotels in Six Flags Fiesta Texas start at $84 per night. Prices and availability subject to change. Additional terms may apply.